Dr Organic is a large skincare line which can be found on the high street at Holland & Barrett. I have been looking at the range for months and months but never took the plunge into making a purchase. The brand contains no harsh chemicals and all products are suitable for vegetarians (some are vegan friendly). You will find a variety of skin care items within the following ranges - Aloe Vera, Pomegranate, Tea Tree, Vitamin E, Lavender, Virgin Olive Oil, Royal Jelly, Rose Otto & Manuka Honey. I had been looking for a natural face scrub/exfoliator for quite some time. Even though I have sensitive skin I like to use a face scrub so I can eliminate flaky dry patches. It is important that the scub is very gentle in order not to aggravate my skin. 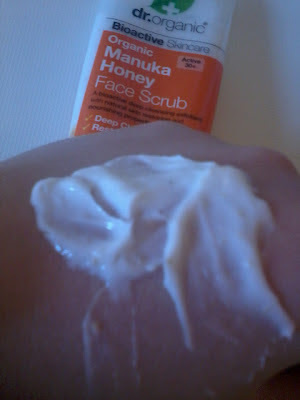 This scrub has a very strong smell of honey which I like but I can see that it might not suit every sense of smell. The product has a cream consistency. The grains are very fine but still have enough abrasion to do the job. After using this product my skin is soft, glowing and does not feel tight or dry. I do not have to apply my moisturiser immediately after I have scrubbed. The entire range has a really good price point. I purchased this scrub for £5.99 (125ml) there was a slight variation in price between this one and the Rose Otto and Olive Oil but only by a few pennies. Overall I am very impressed. 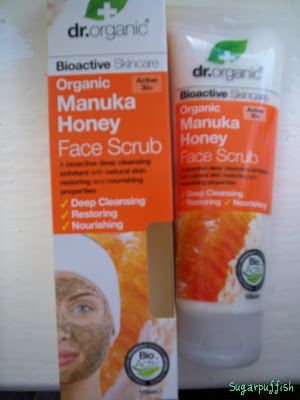 I am definitely going to be purchasing this product again and will be taking a look at the other skin care products by Dr Organic. Has anyone else tried Dr Organic? I would love to hear what you think. @Su Yes Manuka is really good for skin & I understand it is better for your skin than Tea Tree. Hi I bought the Face scrub 2 days ago and it had a strange smell, a bit like a moldy smell?? Did you get the same impression? ?